In yesterday's Miscellaneous Ramblings column on Time Machine adventures and hard drive reliability, I referred to the Daystar AnyDrive USB 2.0 Adapter, as having proved very useful in helping me sleuth out a troubleshooting issue. Editor Dan Knight commented, "The Daystar device sounds remarkably practical!" Indeed it is a really useful tool to have around when you're working with drives. Back in the days when SCSI was the fast peripheral interface on the Mac, I used to have several SCSI drive housings into which I could insert a hard drive, an optical drive, or whatever, and connect it to various computers via a SCSI cable. This worked pretty well once you configured a compatible connection (with appropriate termination), and it helped squeeze some more usefulness out of drives that had been pulled in favor of higher-capacity ones. With the Mac's move to FireWire, it got even better: eliminating SCSI termination issues, supporting hot-plugging (which is huge), supporting FireWire Target Disk Mode (which is much better than the old SCSI Disk Mode), and no-hassle bootability. 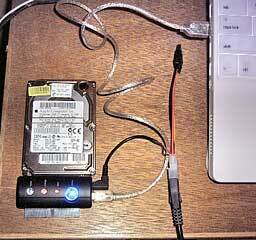 As before, one can stick a pulled hard drive into an external FireWire housing and mount it as a local volume. I've been doing this for years with a little QPS Que M4 drive housing. Unfortunately, Apple seems to be losing interest in FireWire, even though it's Apple technology. They dumped FireWire support from the iPod several years ago, and the MacBook Air is the first Mac system since the 350 MHz version of the summer 2000 iMac to ship without a FireWire port. The orientation is now solidly toward USB 2.0, which is a pretty good do-all I/O and peripherals interface, although somewhat less satisfactory than FireWire for connecting external drives. USB 2.0 is more persnickety about bus-powering. I have a little iRocks USB 2.0 housing for 2.5" IDE hard drives, and it will bus power from the USB ports in my Pismos and G3 iBook, but not the USB 2.0 ports in my 17" G4 PowerBook, on which it requires an external self power supply, which is a major extra hassle. These days, there is also the added complication of supporting the newer SATA (Serial ATA) drive interface, which has replaced the older IDE in newer Apple systems. The good news is that there is a cool and convenient ways to utilize the good aspects of USB 2.0 for external drive connections. One is Daystar's XLR8 AnyDrive kit, an inexpensive, versatile, and potentially invaluable enabler that allows you to connect any loose 2.5" or 3.5" IDE drive or any size of size of SATA drive to a Mac or PC via USB 2.0. No drive enclosure needed. Simply plug in a bare drive and your Mac can mount it. It reminds me of some of my SCSI connection jury-rigs back in the day, but without the termination hassles or the need to shut down for cabling connection and disconnection. 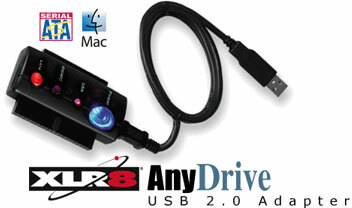 No extra drivers are required for the Mac, for which the Anydrive is plug and play. (For Windows-sufferers, Daystar includes a CD with Windows XP drivers.) The AnyDrive interface supports up to USB 2.0's nominal (but never realized) 480 Mb/sec throughput for 3.5" or 2.5" IDE and SATA drives. AnyDrive includes an AC power adapter, the USB drive adapter, and an additional flex connector cable for hard-to-get-to connectors. 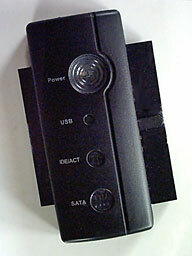 The device is fully USB 2.0 compatible and supports up to 480 MBits / sec transfer rates. The power supply is auto switching from 100v - 240v. As we noted yesterday, one of the marquee features in "Leopard" (Mac OS X 10.5) is Time Machine, the operating system's built-in automated backup utility with a 3-D user interface that simplifies backup and restore functions into a simple, typically Macintosh visual operation. Just connect a backup drive of sufficient capacity - USB 2.0 or FireWire - enable the drive to use with Time Machine, and let it do its stuff (this will take a very long time the first time around). Once your initial global backup is completed, Time Machine will work in the background and every hour back up files you update, add, or otherwise modify. A Restore button handles copying selected files back from the backup drive. I love Time Machine, which makes data backup essentially painless. Apple says that its research reveals that prior to the release of Leopard, fewer than 4% of Mac users were performing regular, automated backups - and only about 26% of Mac users ever backed up anything at all - so an awful lot of users were out there crusin' for a real bruisin' come a catastrophic hard drive failure (inevitable if you keep using computers long enough, theft or loss of their notebook, or other disasters). I've been preaching the backup religion for years, but I fear that I've made few converts, even among my own family and close associates. I have to concede that I wasn't backing up as often as I should have, although I do use double-redundant backups. With Time Machine, it's just a matter of plugging in an external drive and letting the software do its stuff. I don't keep an external drive connected all the time, but I'm certainly backing up more often than I used to. As users upgrade to Leopard, Time Machine should get a lot more people backed up, provided they can be convinced to buy and connect suitable backup media, which at this point means another hard drive. Since you're reading Low End Mac, perhaps you already have a loose hard drive or two laying around, pulled from one of your computers when you upgraded to a larger, faster drive, but still perfectly serviceable as a backup volume. 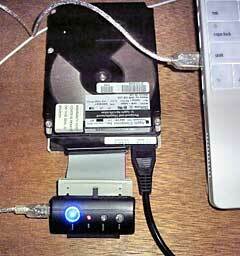 Bare hard drives are relatively inexpensive, especially if you shop around for discount deals or used units. Another issue that comes up from time to time is wanting to access the contents of a drive for which you have no external enclosure housing handy. 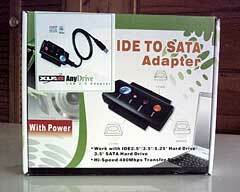 For example, if you want to connect a SATA or 3.5" IDE drive to a PowerBook. In any of these scenarios Daystar's new XLR8 AnyDrive kit is an inexpensive and flexible workaround. 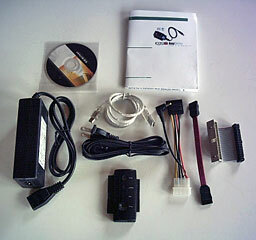 An Power Adapter with connectors for 3.5" and 2.5" IDE drives as well as all sizes of SATA drives. The power supply is auto switching from 100v - 240v. Plus a mini CD-ROM with Windows 98 and XP drivers that Mac users can blissfully ignore. No extra drivers are required for the Mac. AnyDrive comes neatly packaged in a handy-sized compartment box which can continue to serve as a storage container. There is a disappointingly sketchy instruction sheet, which really needs some fleshing out. I found it confusing, especially on the details of the differences in connecting various types of drives. Fortunately, it becomes fairly intuitive with a bit of eyeballing. The AnyDrive module has female pin connectors on either side to accept 3.5" and 2.5" (laptop-size) IDE/ATA hard drives respectively, while SATA drives connect through a supplied adapter cable which plugs into a port on the module's bottom. Connect your drive to the AnyDrive module. As noted, I had to use the supplied ribbon cable extender to clear the power cable connector with the 3.5" IDE drive I used. With the 2.5" PowerBook drive I checked out, I was able to plug directly into the module, as the power is supplied through a small jack via the adapter connector. Plug in the power adapter and the drive should power up. Now, just use the supplied USB cable to connect the AnyDrive module to your computer, and the hard drive should mount on your Desktop. Be sure to eject the external drive before disconnecting the AnyDrive unit. This all works slickly and flawlessly with two sizes of IDE drives that I tested. I didn't have a loose SATA drive handy to test, but I would anticipate equally satisfactory performance with one of those. The AnyDrive adapter is an excellent and handy connectivity tool to have around, and if you want a Time Machine backup volume on the cheap, its friendly price of $24.95 plus an on-hand, scrounged, or inexpensive used hard drive of whatever size and interface won't bust your wallet. The included (some of them hard-to-find) cables, connectors, and adapters alone are worth the modest price. I'm a bit wary of the very light diameter of the wires connecting the 2.5" IDE/SATA power adapter mini-jack to the cable plug. They look like they could easily fatigue or be damaged by even minor shock loads. It would also be nice if there were an inline power switch in the power adapter cable so it wouldn't be necessary to unplug the adapter from AC current in order to power down the connected drive. Aside from those niggles, it's all good.